I’ll take any excuse to make something delicious and hot pink with rhubarb, especially if that excuse is the celebration of a brand new baby girl who the always awesome Stephanie–aka Girl versus Dough–will be welcoming in just a few short weeks. A whole bunch of bloggers are celebrating Stephanie with a bit of a virtual baby shower–be warned, there are LOTS of delicious links below. If you follow Stephanie’s blog (which you should), then you know she posts beautiful and delicious recipes regularly on her blog–even in the midst of her pregnancy! She’s a champ, really. Plus, if you follow her on Instagram you may have even seen a peak of her adorable bump. I mean, it’s the kind of cute-bump to envy. So, in celebration of Stephanie and her sweet girl, I made these little parfait cups. 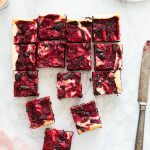 This completely no-bake treat combines my favorite springtime fruity-vegetable with a sweet + tangy cream cheese filling and crunchy graham crust layered all pretty-like for a sweet, tart, creamy, crunchy dream of a dessert. All of that said, Stephanie, we cannot wait for your little one to arrive! She is going to be one lucky little lass with such a beautiful, talented mother to make her treats and love her to pieces! Hurray!! This recipe makes extra rhubarb sauce, which is perfect for spooning over plain yogurt or vanilla ice cream. In a saucepan combine the rhubarb, raspberries, sugar, and lemon juice. Heat the mixture over medium heat until the fruit releases it’s juices. Bring the mixture to a simmer and cook about 10 minutes, stirring occasionally. Remove from the stove, cool, and store in a jar in the fridge until ready to use. In a bowl mix together the graham crumbs and coconut oil until well combined. In another bowl, mix together the cream cheese, yogurt, and sweetened condensed milk. 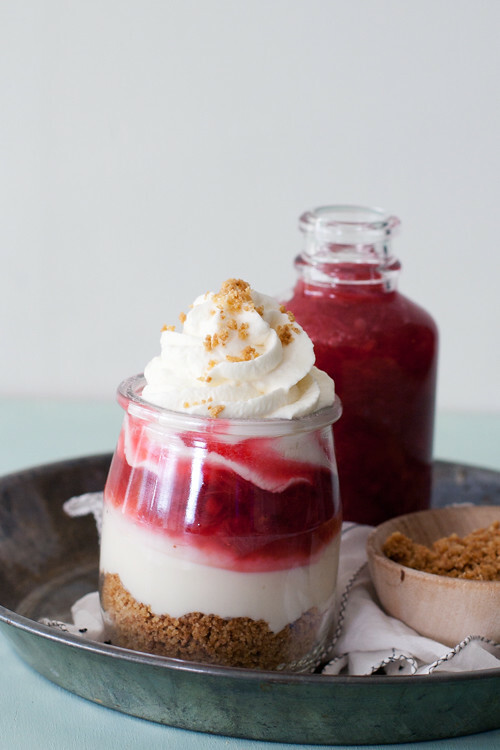 Layer graham cracker crust into the bottom of 4-6 glasses or jars, followed by the cream cheese mixture, and finally as much rhubarb sauce as you like. Top with whipped cream before serving. 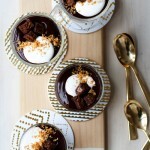 These are the sweetest parfaits! Of course I’m in love with the hot pink color and I bet the cheesecake/graham/rhubarb combo is so, so good. It’s a good one, for sure! Hot pink foreva! Thanks, Nicole! Anything hot pink with rhubarb is awesome in my book too!! LOVE this! Of course!! Virtual bear hugs! <3! Having extra rhubarb sauce is one thing I wish I could say all year long… thanks for sharing such a pretty dessert! Gotta get it while we can! Thanks, Aida! I’ve never wanted to climb inside of a parfait so badly in my life!! These look amazing! 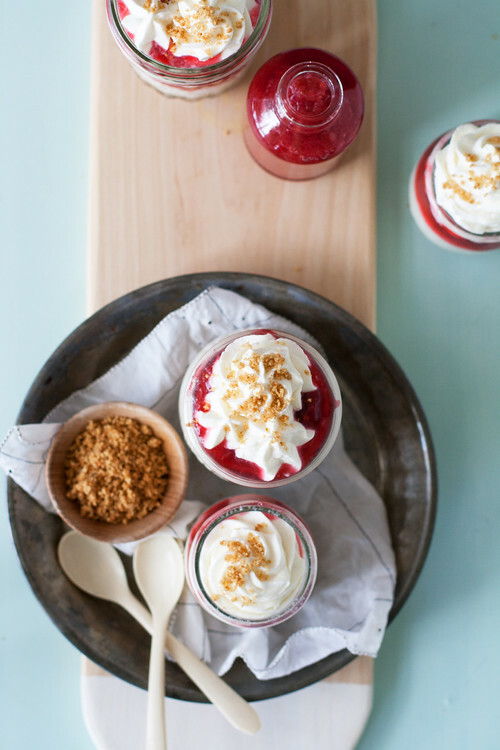 I love that it’s rhubarb season and love your beautiful rhubarb cheesecake parfaits! I absolutely LOVE rhubarb and need this recipe in my life! Pink perfection. Yay for hot pink rhubarb! And yay for Steph! Oh la, Cindy, these are gorgeous! Rhubarb is one of my favorite things to put in sweet stuff and I LOVE the fact that this is no-bake. Looks perfect for summer! Yes! No-baking is the best when the oven is just too much to deal with. Thanks, Amy! Did you ever knowwwww that you’re my HEEERRRROOOOOO? Everything I hope toooooooo beeeeeeee? So pretty!! and no bake. I can get down with no bake.. Sometimes it’s just gotta be easy. Ok Rhubarb needs to makes an appearance soon. 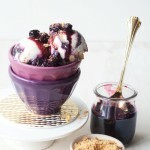 These parfaits look amazing!!! What a lovely easy recipe! Plus you can change to any fruit you want as well, although I think the tartness of the rhubarb is perfect here. you could definitely switch it up! What a pretty and delicious treat! 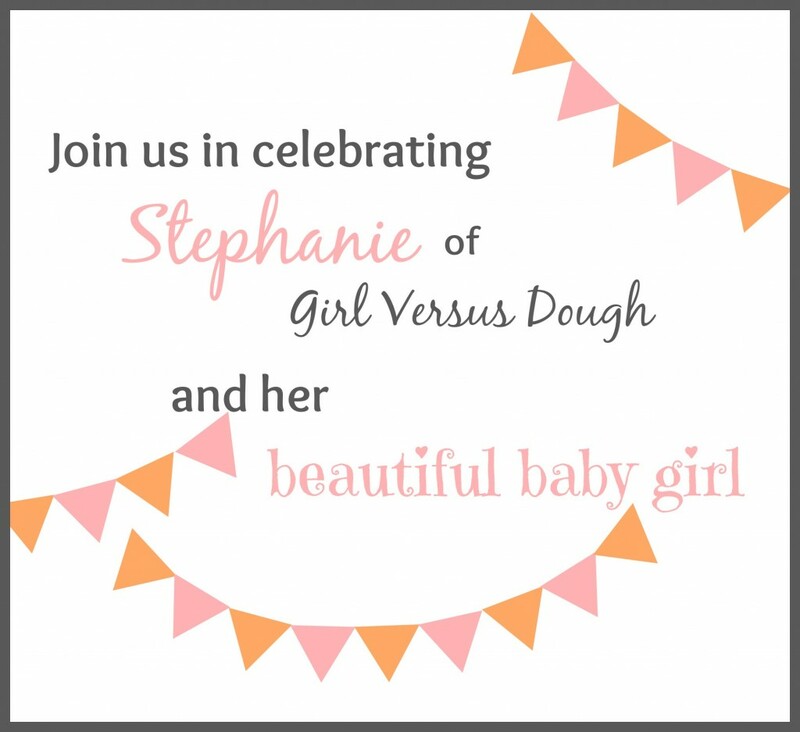 Happy virtual baby shower, Stephanie! I hope spring and rhubarb show up soon there! These are so dainty and I LOVE that they are no bake. Means more time for eating! I love serving little dessert parfaits at parties. These are so festive and perfect for Steph’s shower! I totally agree! Thanks, Lauren! That pretty-in-hot-pink rhubarb is gorgeous! And oh so perfect for the imminent arrival of a sweet little girl. Love these cheesecakes! Could these BE any more beautiful? …I just checked. The answer is no. I adore everything rhubarb and this is no exception! Thank you so much for hanging out with us today and adding some sweetness to the day! Of course! and thank you!! These would probably be my favorite thing on the planet! 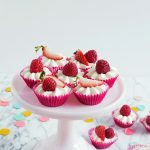 I love strawberry rhubarb so much and these look to die for! Rhubard is my new best friend. I FINALLY found some gorgeous stalks today and am so excited! These are the most gorgeous cheesecakes EVER! Love them. YES! I am so glad you found some! These parfaits look super delicious! Love the rhubarb- so tangy and tasty! 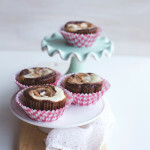 Would love to give this recipe a go! Gorgeous parfaits! Strawberry rhubarb is one of my favorite combinations! I just started growing my own rhubarb this year. I can’t harvest it for another year, but I obviously won’t wait until then to make these awesomely delicious cheesecake parfaits. Total beautiful deliciousness right here! These are stunning and awesome! 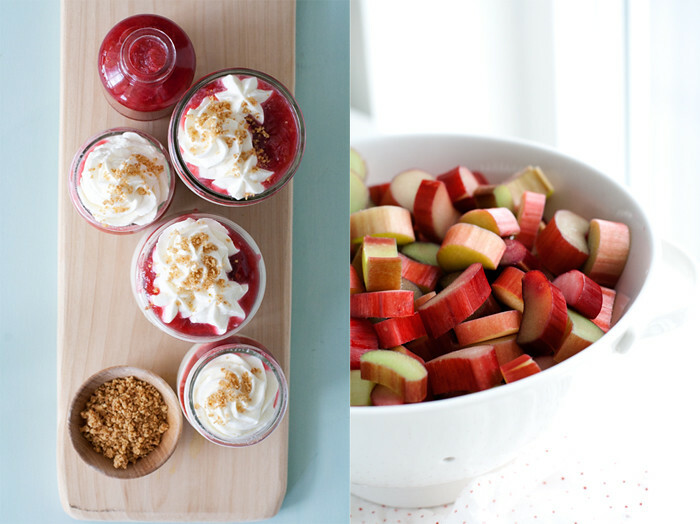 What a perfect way to showcase rhubarb. Yum!! I am so smitten with these sweet and sour treats! Just gorgeous.